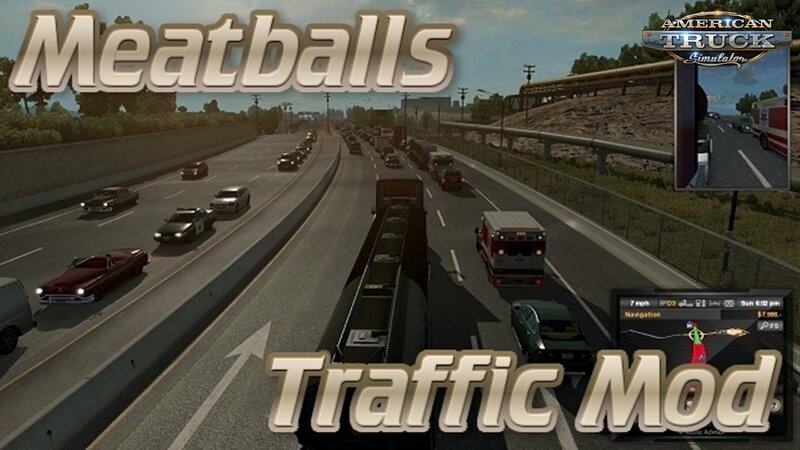 Download mod Meatballs Traffic Density Mod v1.7.8 (1.33.x) for ATS | American Truck Simulator game. Brings the highways of American Truck Simulator to life. This increases the amount of cars on screen, and will obviously be more demanding on your PC than the vanilla settings. Be prepared to adjust your graphics if you experience frame rate drops! evening rush hours, quiet nights, and a steady flow during the daytime. Be prepared. This is still a work in progress as I try to perfect the settings in light of SCS Software's ongoing work to improve the game. Please note that I do not test with nor support any beta versions! Please set this to load as a top or very high priority.